Transformation graphs in CloverDX Server environment allow you to define secure graph parameters. Secure graph parameters are regular graph parameters, either internal or external (in a *.prm file), but the values of the graph parameters are not stored in plain text on the file system - encrypted values are persisted instead. This allows you to use graph parameters to handle sensitive information, typically credentials such as passwords to databases. Secure parameters are only available in CloverDX Server environment, including working with CloverDX Server Projects in CloverDX Designer. The encryption algorithm must be initialized with a master password. The master password has to be manually set after Server installation in Configuration → Security. Secure parameters cannot be used before the master password is set. The maximum length of the master password is 255 characters; there are no other restrictions or complexity requirements. After setting the master password secure parameters are fully available in Graph parameter editor in CloverDX Designer. 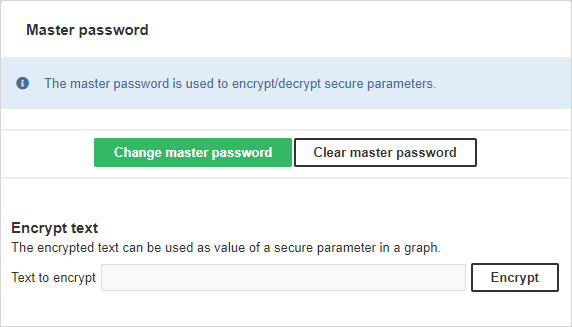 When setting value of a secure parameter, it will be automatically encrypted using the master password. Secure parameters are automatically decrypted by the Server in graph runtime. A parameter value can also be encrypted in the CloverDX Server Console in the Configuration > Security > Secure Parameters page - use the Encrypt text section. If you change the master password, the secure parameters encrypted using the old master password cannot be decrypted correctly anymore. In that case existing secure parameters need to be encrypted again with the new master password. That can be accomplished simply by setting their value (non-encrypted) again in the Graph parameter editor. Similar master password inconsistency issue can occur if you move a transformation graph with some secure parameters to another Server with a different master password. So it is highly recommended to use the identical master password for all your CloverDX Server installations. See documentation of secure parameters in CloverDX Designer manual for further details. Encryption of secure parameters can be further customized via Server configuration parameters. The algorithm to be used for encryption. This algorithm has to be supported by your JCE provider (if you specify a custom one, or the default JVM provider if you don't). The name of algorithm should start with PBE prefix. The list of available algorithms depends on your JCE provider, e.g. for the default SunJCE provider you can find them on SunJCEProvider or for the Bouncy Castle provider on Bouncy Castle Specifications (section Algorithms/PBE)). security.job_parameters.encryptor.master_password_encryption.password clover The password used to encrypt values persisted in the database table secure_param_passwd (the master password is persisted there). security.job_parameters.encryptor.providerClassName Empty string. The default JVM provider is used (e.g. for Oracle Java the SunJCE provider is used) The name of the security provider to be asked for the encryption algorithm. It must implement java.security.Provider interface. For example set to org.bouncycastle.jce.provider.BouncyCastleProvider for the Bouncy Castle JCE provider, see below. Algorithms provided by JVM could be too weak to satisfy an adequate security. Therefore it is recommended to install a third-party JCE provider. Following example demonstrates installation of one concrete provider, Bouncy Castle JCE provider. Another provider would be installed similarly. Set value of the security.job_parameters.encryptor.providerClassName attribute to org.bouncycastle.jce.provider.BouncyCastleProvider in the config.properties file. Set value of the security.job_parameters.encryptor.algorithm attribute to the desired algorithm (e.g. PBEWITHSHA256AND256BITAES-CBC-BC).